Mission Statement: To provide the most economical and element protective shelter using the highest amount of recycled material to house as many cats as possible for an affordable price. About our Shelters: Our shelters are constructed using recycled fish boxes that were used to transport salmon to market. They are rinsed, dried and assembled, the slight smell of fish attracts the cat into the shelter. The shelters are assembled using heat welded plastic strapping. 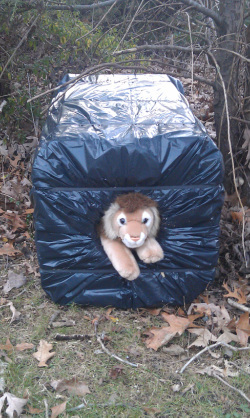 Plastic drum liners are used to both provide water protection for the shelters and help conceal/hide them from view. All shelters come with straw (not hay, hay retains water), and drain holes. Sizes of shelters are approximate, supply of boxes determine size. The wall thickness is about 1.25 inches. We are currently developing new shelters, please check back to see new designs. Prices: We try to keep these shelters affordable. Prices may increase as we need to rent storage to make them available to meet demand. Unfortunately, many people only order shelters when it gets cold, we could not keep up with the seasonal demands and need to make the shelters months in advance. Shipping: These shelters are expensive to ship, we will assist in arranging delivery. Location: We are located 50 miles east of New York City.